Sixteen police officers were investigated for racist behaviour in the past four financial years, one officer in 2010/11, seven officers in 2012/13 and eight officers in 2013/14, according to the PSNI. 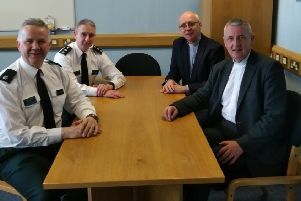 All of these officers were investigated in relation to inappropriate text messages that included content of a racist nature, the PSNI confirmed. The PSNI confirmed that as a result of investigations into the inappropriate text messages the Deputy Chief Constable issued an organisation-wide direction. The circular pointed out to members of the force that: “The Code of Ethics outlines the high standards of behaviour expected from police officers both on and off duty. The circular went on to instruct officers that the public has a right to expect them to evidence the highest standards of behaviour both on and off duty. “Text messaging can be appropriate for all sorts of acceptable, informative, humorous and positive uses. “However sending inappropriate, offensive texts or images is not acceptable behaviour. In certain circumstances sending such texts may not only be a breach of the Code of Ethics but also a breach of the Telecommunications legislation. “It is clearly unacceptable for Police Officers to send inappropriate text messages, on or off duty,” the instruction advised.